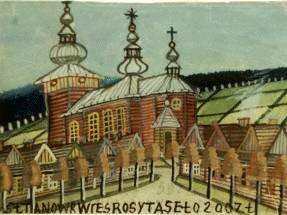 Nikifor was born in the region of Podkarpacie, Poland in 1895. He was the son of a domestic servant and an unknown father. After the death of his mother, Nikifor was forced to provide for himself as a beggar. He was illiterate and had a severe speech impediment, making communication difficult for him. 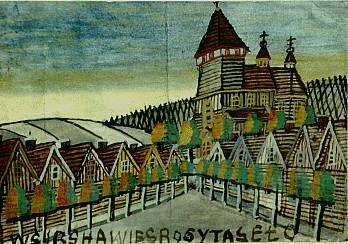 During a hospital stay as a child, Nikifor was given a set of watercolours by a doctor and began painting. Throughout his life he travelled from village to village selling his art. He marked his work with a round seal stamp that identified him as Nikifor-Matejko (the last name borrowed from a famous Polish artist), indicating his desire to be considered a proffesional artist. His subject matter includes cityscapes and architectural renderings based on his various travels, as well as religious images. His forms are simple and his compositions are busy with colour. Nikifor received recognition for his are late in his life, by which time the creative process was more of a burden to him than a means of expression. With thanks to Antony Petullo Collection, "Driven to Create" page.101.